Fr. 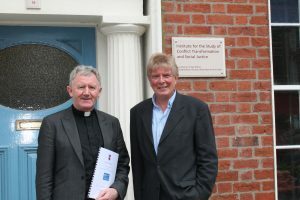 Patrick Devine SMA, Executive Director, The Shalom Center for Conflict Resolution and Reconciliation with Professor Hastings Donnan, Director, Institute for the Study of Conflict Transformation and Social Justice at Queen’s University Belfast. A programme which builds peace and fosters reconciliation in areas of conflict, which was devised by an Irish priest, is to expand to a number of countries in Africa following its success in northern Kenya. The model used by the centre is based on extensive research into areas of conflict and the issues that drive conflict. It works through key community opinion shapers such as elders, women, youth and influential chiefs. The process brings about a collectively reached common understanding of both the history and definition of a conflict’s source, while trust and co-operation are built to reach solutions. Now, Fr Devine’s model is to be established in other parts of Africa, starting with Côte d’Ivoire, Tanzania and the Central African Republic, with further plans to establish centres in Ethiopia, South Sudan, Nigeria and the Democratic Republic of Congo. Fr Devine is a member of the Society of African Missions, which he joined in 1979. The missionary has been short-listed for this year’s Tipperary International Peace Prize and is also due to deliver the 2017 Dermot Earley Memorial Lecture in NUI Maynooth on 23 November. In 2013 the International Caring Award was presented to him in Washington by Colin Powell. Since ordination in 1988, Fr Devine has spent almost 30 years in Kenya and Tanzania. In 2009 he founded the Shalom Centre to try to deal with the conflict in the Ilemi Triangle. The instability in the area had resulted in state neglect and a lack of adequate healthcare and schools. Conflict resolution, he believes, is essential for social development and reconciliation. Originally from Frenchpark in Co. Roscommon, the 56-year-old studied for a BA in Sociology, History and Philosophy; a BD in Theology; a Diploma in Mission Studies and an MA in Peace Studies and International Relations. His MA thesis focused on the Turkana Dassenach conflict and its causes and consequences. The area he studied is one where Ethiopian, Kenyan and South Sudanese claims converge. He began his missionary life in a remote area of western Tanzania, where his work focused on enabling religious and social values to take root, constructing schools, medical institutions, women and children development centres, water projects and income-generating initiatives. According to Fr Devine, weak institutions, porous borders and climate change combine to make conditions harsher, nurturing historic, sometimes violent competition over scarce resources between the 11 ethnic communities of northern Kenya with which the Shalom Centre works. In 2007/08, post-election violence in Kenya, fuelled by political in-fighting, retaliation and power struggles, left roughly 1,300 Kenyans dead, 60,000 maimed and 600,000 displaced. The Shalom Centre’s strategies include sustainable human development in conflicted communities through projects. It has tangible results, such as the building of solar-powered inter-ethnic and inter-religious schools, medical centres and water projects. The Shalom Centre’s school projects have brought about the upgrade, building, expansion or electrification of 124 schools in Kenya. Over the course of his missionary life, Fr Devine has also been a member of many strategic planning synods and councils for the local Church and the SMA worldwide. He was elected deputy SMA Superior for Tanzania and Kenya and SMA Superior twice. In 2003 Fr Devine was also elected Vice Chairman of the Religious Superiors Conference of Kenya (RSCK), which comprises 64 religious congregations with a membership of over 4,000 missionary and development personnel committed to evangelisation and social, educational, medical and human development in East, Central and Equatorial Africa. work with local leaders and influential opinion shapers to ensure they are part of the long-term solution to preventing conflict, engaging them in problem-solving workshops. conduct peace education in primary and secondary schools and with groups of influential opinion shapers in conflict environments, aimed at delegitimising the use of force in solving conflicts. Shalom benefits from Memoranda of Understanding with the governments of eastern Africa that make up the Intergovernmental Authority on Development (IGAD). The Centre also partners with international and regional colleges and universities on peace-building courses, as well as religious association and councils in Africa. It makes its findings available to partners, relevant governments, ethnic representatives and United Nations and regional organisations.